The Resident Tourist: Twenty-Twelve Resolution . . . Yes, I realize we're almost two weeks into the new year, but I have finally settled on my resolution for 2012. After running through all the usual suspects - get fit, get organized, get up earlier - I decided I'd like to make a resolution that I can actually measure. I want to be able to quantify my progress as I work toward a meaningful goal. Right now, my most important project (apart from my health) is The Resident Tourist. So, as my 2012 resolution, I will attempt to get 500 followers to join this blog by its one year anniversary, November 1, 2012. I realize that is quite a number of readers, and that it will take persistent work and effort, but what else are resolutions for, right? I will, however, need a bit of your help. Just an extra fifteen seconds on this site will make me closer to my 500 follower goal. And don't worry, there will be something in it for you too. If I get 500 or more followers by 11/1/12, I'll promise to share a special secret with you. As more followers join, more details will be revealed. 3. Depending on what sort of account you have, click on the icon of your choice. For instance, if you have a twitter account, join through twitter. If you have a gmail address, join through Google, etc. 4. 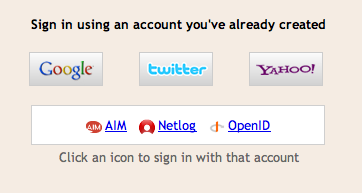 After choosing your account, you will need to sign in. 5. You will be asked how you'd like to follow The Resident Tourist, select publicly, and hit Follow this Blog. That's all it takes, just a few simple clicks. 6. 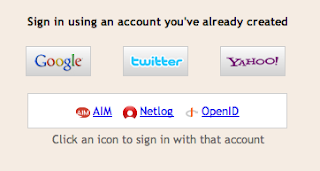 Now, if you don't have a Google/Gmail, twitter, Yahoo!, AIM, Netlog, or OpenID account, you can easily set up a google account HERE to join. Enormous thanks to those who have already joined. If you like what you've read so far, I ask that you tell your friends, family, colleagues and coworkers about The Resident Tourist. If any of them decide to join, then I just might be able to make my 500 goal. In an effort to get all these followers, I will be sure to better focus my blog on New York City, post regularly, and take all your suggestions for what you'd like to see on The Resident Tourist. Part of focusing the blog more means that I will be taking my camera everywhere I go. From the three Michelin star restaurant, to the doctor's office, to the park. I'm trying to find the right balance between words and photographs - so any feedback at all will be helpful. Let me know what you're thinking, leave a comment or send an email, and most importantly become my follower. Join this site.